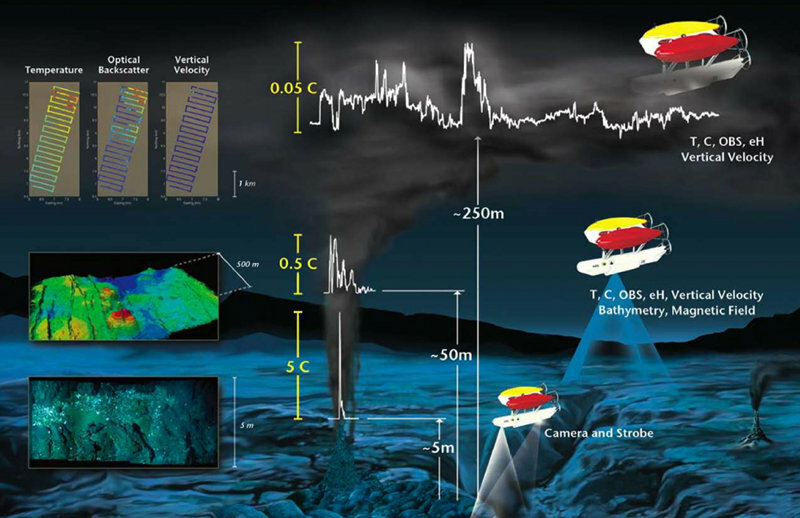 Jolted by the planet's biggest earthquakes, sequestering massive reservoirs of methane, while slowly swallowing a mid-ocean ridge, the Chilean margin offers an inspiring natural laboratory for investigating the complex interactions among the solid earth, the deep ocean, and the biosphere. 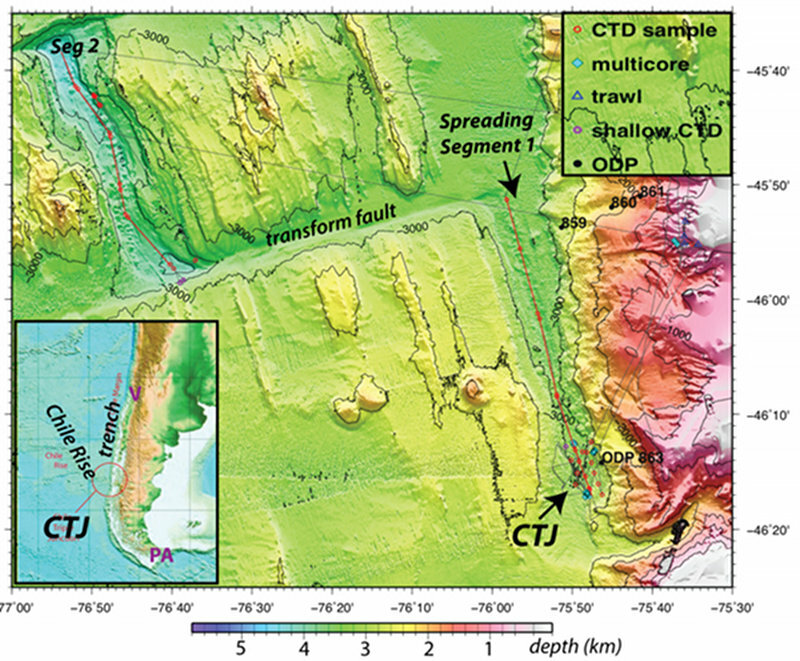 At the Chile Margin (CTJ), where the South Chile rise (a ridge crest) is being forced under the methane-rich South American continent, an international team of scientists will explore for tectonically controlled hydrothermal vents, for seep sites of where methane is released, and for novel "hybrid" systems that may yield hot seeps or cool vents. The INSPIRE: Chile Margin 2012 expedition is a follow-up to the 2010 expedition. During the 10-day cruise on the R/V Melville, we will probe for strange new biological life forms, communities, and ecosystems dependent on as-yet-unknown conditions. Members of the INSPIRE team will use an autonomous underwater vehicle (outfitted with cameras and chemical sensors) called Sentry - in combination with instrumentation to measure conductivity, temperature, depth (CTD), a multicorer, and a towed camera system - to locate and characterize heretofore unknown and some barely known ecosystems. The Chile Margin (CTJ) is a globally unique area where there is a confluence of both geological and biological aspects of processes that control bio-geochemical exchange. An oceanic spreading center subducts beneath the Chilean margin at the Margin; slope sediments deform and produce methane and some are deposited in the axial zone of the southernmost part of the spreading center. 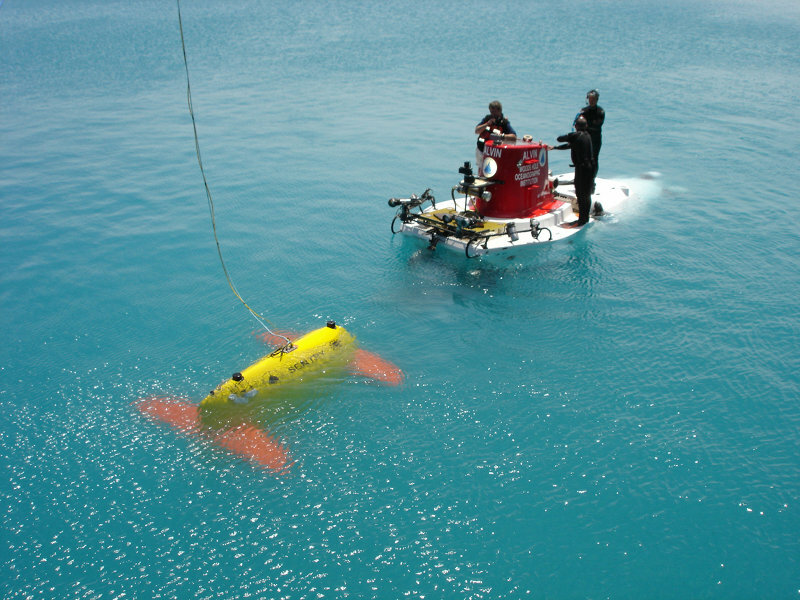 During the first decade of the 21st Century, a new approach to vent-exploration was pioneered using the Autonomous Benthic Explorer autonomous underwater vehicle (ABE AUV) designed and built at Woods Hole Oceanographic Institution (WHOI). One of the major goals of the Census of Marine Life’s ChEss (Chemosynthetic Ecosystems) field program was to answer the question: What controls the biogeography and biodiversity of vent and seep ecosystems? Perhaps the single biggest change is that we will start our 2012 exploration by focusing on the seafloor, rather than the overlying ocean, to search for hydrothermal vents. One of the important new devices that Sentry is equipped with is a sidescan sonar system.